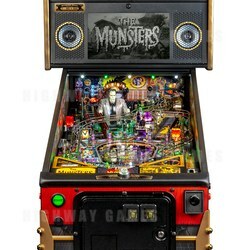 Stern takes fans back to 1313 Mockingbird Lane with the release of its The Munsters Pinball Machine. Based on the hit American sitcom, The Munsters, Stern's newest pinball machine will come in three editions: Pro, Premium and Limited Edition. The Limited Edition model has been limited to a production run 600 machines with custom casket-themed artwork, making it a must-have for any fan of the series. The Munsters is a hit American sitcom on CBS. It featured the Munsters family, with characters like Herman (Frankenstein's monster), Lily and Grandpa (vampires), Eddie (werewolf) and Marilyn (who's just a normal girl). The series was a satire of both traditional monster movies and normal family lives of the era. Stern's The Munsters pinball machine includes the beloved characters above, as well as Spot, The Raven, Kitty and Igor. The Munsters car Drag-U-La also makes an appearance to completely this haunting family. - Custom Scultped bash toys of Herman and Spot.